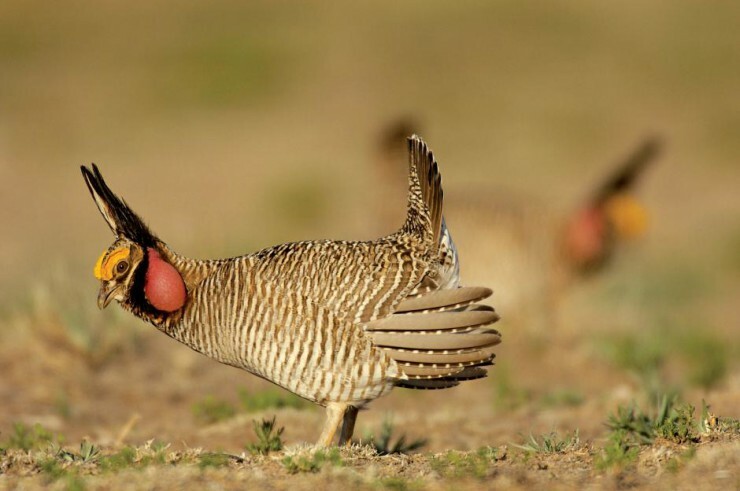 The lesser prairie chicken is a strange-looking bird, ungainly in its movement. It has honking red air sacs on its throat, a tufted feather faux-hawk and a particularly squat stature. The ill-proportioned grouse species congregates each spring on a lek, a short-grass clearing where males try to outperform one another and flaunt their physical attributes for the benefit of whatever females come to watch. The LPC, as aficionados call it, does a charismatic jig, rapidly moving from side to side on its stick-legs, and intones booming calls in hopes of attracting the ladies. It lives throughout the U.S. heartland and Southwest and is a staple of American pioneering heritage, once in such abundance that Laura Ingalls Wilder wrote about eating prairie chicken mush in Little House on the Prairie. But today the bird is at risk. The LPC has lost more than 80 percent of its range in recent years because of extensive development from the oil and gas industry and the wind energy sector. The recent drought has also hurt: Dry conditions lead to fewer food sources, which puts a big damper on mating behavior. The lesser prairie chicken population has fallen precipitously, plummeting in 2013 to 18,000 birds across the five states it occupies, a 50 percent decrease from the previous year. The bird’s dire situation means it requires a great crusader, and it has one in Sue Selman, a tough-talking, dungaree- and pink blouse–wearing sort of Dian Fossey of the Dust Bowl. In part, it was a matter of fate for her: Every April for the past seven years, birders have come to Selman’s 14,000-acre ranch in Oklahoma, up toward the Panhandle, to watch the LPC’s mating ritual. It’s part of the Lesser Prairie Chicken Festival organized by the Tulsa Audubon Society. Selman provides access to camouflage tents on her land from which enthusiasts can view the lek. When the prairie tuckers out just before dawn, going silent but for the occasional coyote yelp and pheasant snicker, the LPC starts its chicken dance: thwuck-thwuck-thwuck-thwuck. But this year, there’s not much to see. Selman drove me around the ranch to show me why. As she stalled her mud-caked Suburban in view of the property’s one remaining lek, she stared out at what she views as the true enemy, some 10 miles away: wind turbines. Continue reading here…..
Wind turbines are a disaster any way you look at them except for Samsung and the Liberal agents who promoted them.